Charles Darwin believed that humans evolved in Africa, because that's where our closest ape relatives the chimpanzees and gorillas live. And during the twentieth century he was vindicated through a combination of fossil and genetic discoveries. While our place in the tree of life is now well established - chimpanzees being our closest relatives - the beginning of the human line millions of years ago continues to be shrouded in mystery. The point of focus here is on two main questions. Precisely when did the human branch begin? And how would we recognise the earliest members of our kind from fossil bones? These two questions are clearly interdependent and surprisingly difficult to answer. The problem for us is that many of the features that distinguish living humans from chimpanzees today either don't fossilise, or evolved way too recently to help with sorting out the early fossils. There are a few important exceptions though: our two-footed locomotion ("bipedalism") accompanied by upright posture, and a range of peculiarities of the teeth like a small canine, fewer numbers of roots in our premolars and very thick molar enamel. But even these features aren't always as straight forward as we'd like to think. As we shall see. Can DNA helps us out here? Sadly not. Geneticists can't agree on when the split occurred, with estimates ranging from 4 million to 12 million years ago. This leads many of us fossil boffins to conclude that genetic clocks simply aren't up to the task. These species are especially compelling candidates because there's a large number of bony features demonstrating bipedalism and various human-like dental traits. The cranium of Sahelanthropus even resembles members of genus Homo in several respects, which is a real surprise. Then there are two fragments of bone from Kenya known about since the 1960s and 1980s which are at least 5 million years old. The jaws from Lothagam and Tabarin show similarities (especially in their teeth) to later members of the human line, but are too poorly known to provide anything firmer. 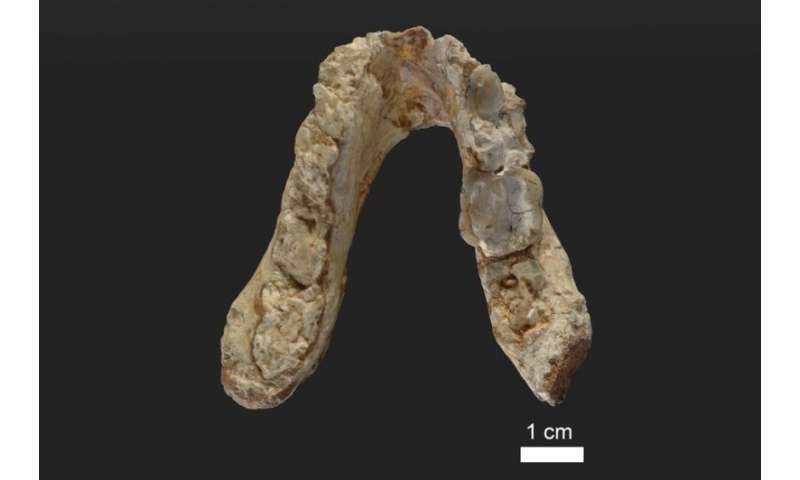 A team led by Jochen Fuss of the Senckenberg Centre for Human Evolution and Palaeoenvironment claims to have found evidence that a roughly 7 million year old ape named Graecopithecus might actually be the oldest member of the human branch found so far. But here's the catch: it's from Europe not Africa! Well, Greece to be precise. Some anthropologists will be throwing their hands in the air proclaiming "not again!" And their minds will be turning to the ferocious debates we once had over similar claims made about two other fossil apes: Ramapithecus and Oreopithecus. Ramapithecus from northern India has become rather infamous in the annals of palaeoanthropology as the ape once thought to be human, and that pushed our origins back to 14 million years ago. I won't go into too many details here - you can read about it for yourself - but it was through a combination of the genetic clock (ironically) and new fossil discoveries that its claimed human status was blown out of the water after two decades of vociferous debate. It turns out to have been a kind of orangutan. Then there's Oreopithecus from Italy, also dated around 7 million years old, which is oddly human-like. In common with early African fossils and living humans, it shares features we would normally associate with bipedalism. Yet the remainder of its skeleton shows clearly that Oreopithecus is not very human-like, and is unlikely to be related to us at all. I'm open to the idea that early humans lived beyond Africa, but Graecopithecus falls well short of proving it. Ramapithecus and Oreopithecus should surely have taught us a thing or two about the dangers of exuberant enthusiasm?